Qing Zhang is a Ph.D. student in Educational Policy and Social Context (EPSC). Qing grew up in Wuhan, China. She holds a Master of Social Work from Washington University in St. Louis and a Bachelor of Social Work from Huazhong University of Science and Technology in China. 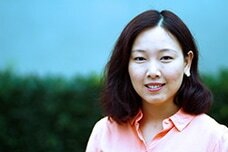 Qing’s research interests in early childhood policy stem from her work experience as a Home Visitor/Parent-Child Educator for disadvantaged children and families at the Chinese American Service League as part of Chicago Public Schools’ Community Partnership Programs. In this position she began to develop strong interests in early childhood program delivery, implementation, and evaluation, and their policy implications. Previously, Qing has worked as the evidence-based Wyman Teen Outreach Program facilitator in a local middle school in St. Louis, promoting healthy behavior and reducing school failure. She also designed two after-school programs fostering cross-cultural communication and diversity awareness for two local middle schools.